Hey! I wanted to drop in and share one of my latest party projects with you. My dear co-worker and friend is hosting is baby shower for her BIL/SIL in March and asked me to design all of the stationery and help with the decorating. 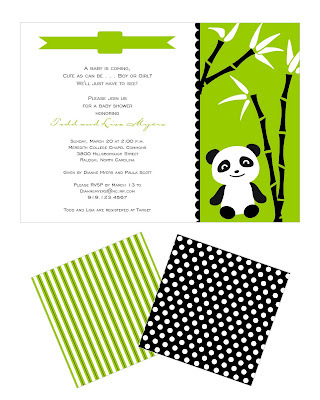 I am busy working on Kayden's birthday party now, but was itching to start on the invitation design! Below is what I have come up with so far and I am happy that she is VERY happy with the start. I also created two patterns that I can use on favor tags and signs once the design on those commences. Thank you Mel for your compliments! I need to head over and see what you have been up to!